Friday saw Rob and I on an adventure to pick up the massive quantities of booze that would be consumed. In all honesty, I think Rob over-estimated what he'd need. We picked up 59 cases of beer and probably about 4-5 cases of 40 oz bottles of liquor and 108 bottles of wine. Crazy. I think Rob had estimated 11 beer per attendee, not including the wine or liquor!? Anyway, two trips to the Ottawa Beer Store Distribution Centre later, we were in business. We then high tailed it to the setup/decorating/rehearsal session out at the venue for the big day, Watson's Mill in Manotick. After setting up and going through the ceremony, the crew made it's way downtown to enjoy a pizza dinner before the big day. Saturday saw the boys get up for some disc golf out at Jacques Cartier Park. Rob treated everyone in attendance to a new disc and beverage. I received a crazy driver that has a dimpled bottom rim, just like a golf ball (it'll take some getting used to but seems to travel pretty far). After a somewhat abbreviated round, we all set off in somewhat different directions in order to get ready for the wedding. Rob made his way home while the groomsmen congregated at my house to get ready. Once we'd all showered and mustered our formal wear we did the final shopping/picking up of flowers, cake and beverage mix. Then it was off to Manotick to set up chairs and get changed. A slightly overcast day turned into a sunny one as the lovely ceremony began. Rob and Anna, and all the gathered masses seemed to enjoy the work of the officiant and things rolled along smoothly. After the formalities were taken care of, the guests grabbed their chairs and carried them over to the dinner tent before gathering for a pre-meal reception in the mill building itself. The grilled dinner was excellent, probably the best wedding food I've had. The quality of dinner was matched by the speeches people gave. 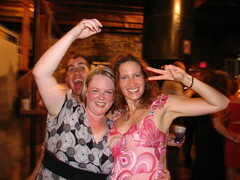 Finally, the night concluded with a dance and post-dinner reception back inside the mill. All the revellers in attendance would agree with me that a great time was had. 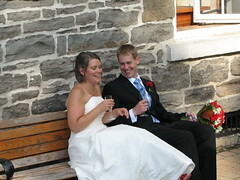 Congratulations to Rob and Anna on their new commitment and a wonderful day. Note: Photos borrowed from Kevin Haggerty.